This week’s session was the stuff of legend. We began with just walking around. Whenever a participant met another, they gave them a friendly shove to test their ability to relax and maintain posture and balance. Then we continued, but with our knees bent at about a 135° angle, with our backs maintaining good posture. This presented a bit of a challenge! Quads aching a bit, then we bent lower to about 90° and continued. Then we crouched fully down and continued, before coming up halfway to the 90° point and then the 135° again before walking normally. We referred to this one as the ‘Walking Around Like We’d Sh…’ umm, never mind what we called it! Nice and simple, we just looked at surviving being pushed over using the backwards fall absorption method. Then we worked from someone picking up one of our legs and pushing us over that way. Nice and slow, and lots of fun. A great way to loosen off and for beginners a good way to get used to partner contact as well as floor contact. Hold a high plank position as though you’ve just done a pushup and, while keeping your arms straight, rotate your shoulders slowly and gently. Work on increasing the rotation you can comfortably manage. This can be done against a wall if that’s too difficult. This ability to rotate the shoulders adds a lot of acceleration to a strike, and can be used for a close-in strike itself from a clinched position. We worked on this with the pads, using pushing and then striking movements. One of the quickest, easiest and most useful kicks in your arsenal is the Oblique Kick: a short, sharp stamp into the shin, knee or ankle with whichever leg is closest. I believe it’s Chris Roberts from SAFE International who’ve coined the phrase ‘closest weapon to closest target’ (at least that’s where I heard it first!) and it’s a good principle to bear in mind. To train this excellent method from Wing Chun Kung Fu, we put on the riot gear and simply worked on stopping an approach with it to appreciate its effectiveness. Instead of merely presenting pads to strike, our friendly padholder would start hitting you with the pads this time whenever they liked. 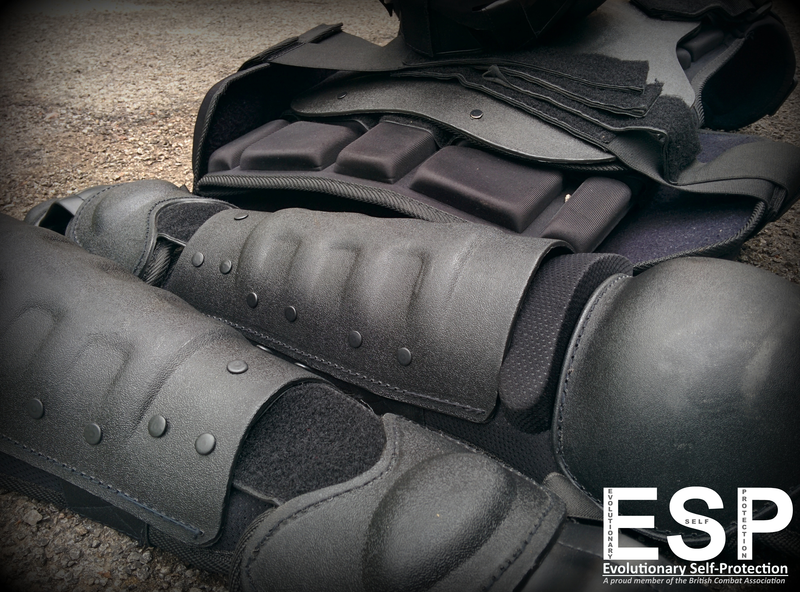 As they were wearing a riot gear chestplate, however, you could lay into them with strikes to the torso as much as you liked while maintaining your cover with a high guard, gaining control and managing that distance. Nice and simple, but fun and useful. To begin, we looked at tensing our abdominal muscles to deal with strikes to the torso. Beginning with ridiculously soft and gentle hits, our partner would slowly increase the power sent at us. We would maintain that tension as a core conditioning exercise, and then whenever it started to push our limits too far, we merely used breathwork, relaxation and movement to absorb the strike and not oppose it. Sit back-to-back (bet you never saw that coming!) on the floor with your partner. On command, turn around and grapple. Get to a position of dominance and stop them from doing the same! You’re not allowed to come up any higher than kneeling height though. Of course, we never want to go to the floor on purpose, and if we end up there we don’t want to stick around either. That said: it’s extremely good fun, it’s incredibly dynamic resistance and cardio exercise and it’s a great opportunity to practise the biomechanical manipulation skills you need to get to a better position from which you can do what you need to and get back up to escape against a resisting partner. To add to things, we had our friendly neighbourhood Samurai Alec with us who is an accomplished, highly skilled Ju-Jitsu practitioner. An awesome session as always – many thanks to all who came and have a great weekend!